The weather has been changing like crazy lately; warn, cold then warm again! Spring weather is about to take hold. We have a large selection of quality spring weather hats to buy. Personally I am looking forward to the warm sunny days and all of the great hats we offer for this type of weather. Hand woven Panama hats from Ecuador with wide or stingy (narrow) brims are starting to look very appropriate. 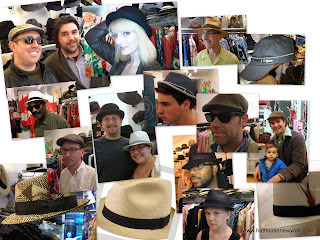 The Hat House keeps a stock of Panamas throughout the entire year in any event so you can send a gift or travel to the islands and have the perfect quality fitted hat with you. Our spring hats designed in Japan are starting to be popular again as the weather turns nicer. If you are looking to buy a hat in New York City, please visit our little hat shop in Soho, NYC 10012. We have a great selection of men and women's hats in all price ranges and styles. You can find us on 131 Thompson Street between Houston and Prince Streets. (Just south of Houston Street). Our hat shop in located in the Japanese Kimono Boutique. While you are visiting us. please make sure to check out the Japanese Kimonos and Robes. Call us at 347-640-4048 if you have any questions.